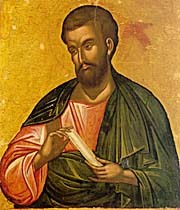 The holy, glorious and all-laudable Apostle Bartholomew (also known as Nathaniel) was one of the Twelve Great Apostles. He is referenced in the Synoptic Gospels and in the Acts of the Apostles. His feast days are celebrated on June 11 (with St. Barnabas) and August 25 (the translation of his relics). It is believed that he is the same person comemerated on April 22 with Apostles Luke and Clement as Nathaniel of the Seventy. After the Ascension of Christ, Bartholomew preached in Asia with the Apostle Philip, Philip's sister Mariamma, and Apostle John. He later preached in India and then Armenia where he was martyred. Prior to India, he was crucified upside down in Hierapolis with the Apostle Philip for causing the death of a great serpent the people worshiped and healing people through prayer. He was removed from the cross during a great earthquake because the people thought God was judging them; St. Philip had already reposed. He then went to India, translated the Gospel of Matthew and cured the Armenian king's daughter of insanity; but the king's envious brother had him crucified, skinned him, and finally beheaded him. Christians buried his body but because of the miracles happening over his relics the pagans threw his coffin into the sea. The coffin ended up at the island of Lipara where Bishop Agathon—who met it via a revelation in a dream—buried it in a church. St. Bartholomew appeared to St. Joseph the Hymnographer and blessed him that he might be able to sing spiritual hymns, saying, "Let heavenly water of wisdom flow from your tongue!" He also appeared to Emperor Anastasius I (491-518) and told him that he would protect the new town of Dara. Later his relics were translated to Rome where miracles continue to occur. shining with the radiance of your teachings and awesome miracles. You enlighten those who honor you, apostle of the Lord, Bartholomew. This page was last edited on June 14, 2016, at 02:46. This page has been accessed 72,612 times.